We received a 16-day-old 1200 g male baby with severe respiratory distress, heart failure, and absent lower limb pulses. Right upper limb blood pressure was 80/50 mmHg. Lower limb blood pressure was 50/30 mmHg. Saturation on oxygen was 85%. 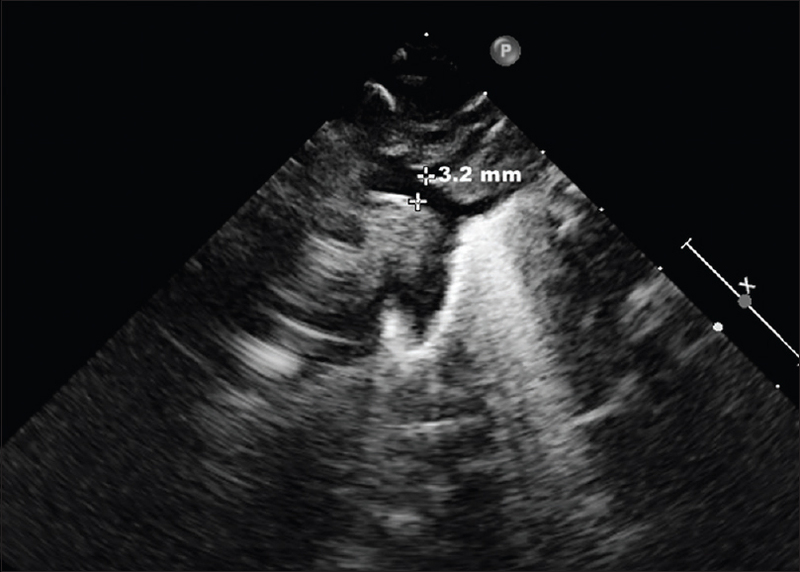 Echocardiography showed 5 mm osteum secundum atrial septal defect left-to-right (L-R) shunt, 3 mm small perimembranous ventricular septal defect L-R shunt, severe discrete coarctation of aorta with a gradient of 30/19 mmHg with diastolic spill, poststenotic dilatation of descending aorta. Transverse arch, isthmus, coarct segment, and descending aorta measured 3.2 mm, 2.7 mm, 1.5 mm, and 5 mm, respectively. Left ventricle ejection fraction was 45%. Baby had to be intubated and put on a ventilator because of increasing distress. After discussing the sick condition of a baby with family and surgeon, it was decided to do balloon angioplasty of coarctation. Although femoral pulses were not palpable, it was decided to go from femoral route with carotid artery access as backup plan. Under general anesthesia and maintaining an optimum temperature of catheterization laboratory, femoral artery cannulation was done using 22 gauze cannula and 0.014 inch percutaneous transluminal coronary angioplasty (PTCA) wire. Three French short sheath was inserted. 50 units/kg heparin was given. Angiogram was done from femoral sheath to delineate anatomy of aorta. Since three French catheters are not available with us, we used microcatheter (Echlone) to enter the aorta. Hand injection was done in arch of aorta with microcatheter to delineate coarctation [Figure 1] and [Figure 2]. 4 mm × 12 mm coronary angioplasty balloon (sprinter) tracked over PTCA wire and coarctation was successfully dilated. Hand angiogram showed laminar flow across coarct segment [Figure 3] and gradient of 3 mmHg. There was no aneurysm formation or dissection seen. 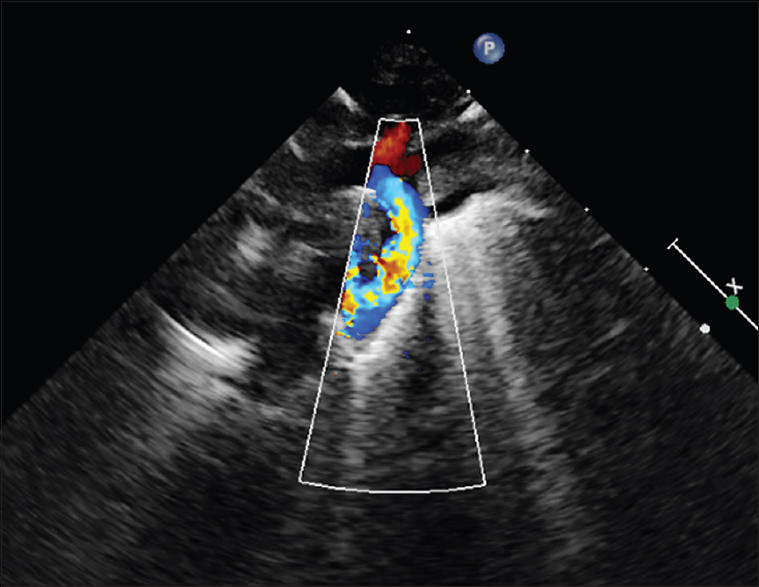 Echocardiography showed laminar flow across coarct segment [Figure 4] and [Figure 5]. Total procedure time was 30 min and fluoroscopy time of 7 min. The patient was extubated next day; respiratory distress settled slowly and ejection fraction improved to normal. Both lower limb pulses were well felt. The patient was discharged at weight of 1600 g and after 3 months of follow-up patient is stable, weighing 4 kg. Echocardiography showed laminar flow across coarct segment with peak gradient of 7 mmHg and normal left ventricle ejection fraction. Surgery is considered as the primary treatment of aortic coarctation in all newborns, including low birth weight premature infants. Balloon angioplasty procedure in the treatment of native coarctation of the newborn is controversial due to high rates of restenosis  and complications such as increased risk of aneurysm formation and damage to the peripheral artery involved in the intervention., We believe that in such small and sick subset of babies, balloon angioplasty is a very good palliative procedure because doing surgery in these babies is having high rates of complications. 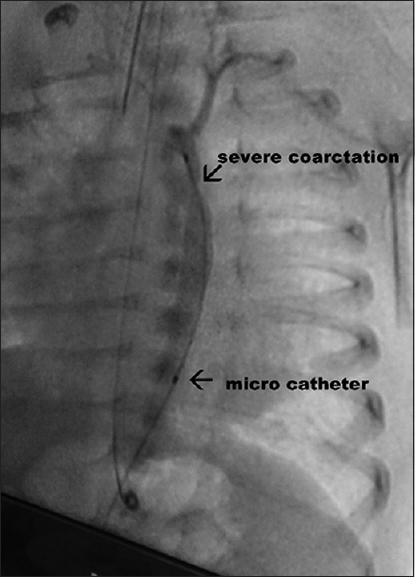 Although cardiac catheterization is associated with complications key things for success are proper planning, use of proper hardware (like the use of microcatheter in this case), keeping the baby warm, and restricting the procedure time as short as possible. Dryzek P, Goreczny S, Kopala M. Interventional treatment of critical coarctation of the aorta in an extremely low birth weight preterm neonate. Cardiol Young 2012;22:475-7. Rothman A, Galindo A, Evans WN, Collazos JC, Restrepo H. Effectiveness and safety of balloon dilation of native aortic coarctation in premature neonates weighing≤2,500 grams. Am J Cardiol 2010;105:1176-80. 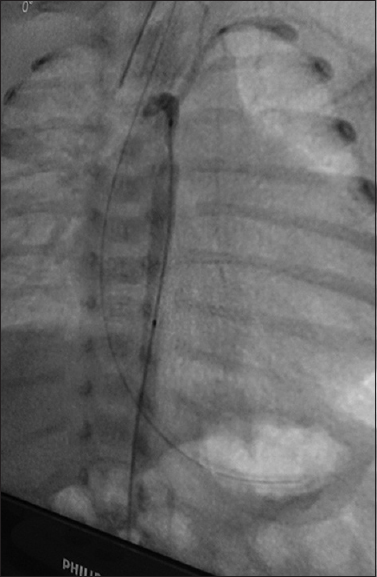 Sreeram N, de Giovanni J, Boehm W. Palliative balloon dilation of native coarctation of the aorta in a preterm infant. Images Paediatr Cardiol 2005;7:1-4. Sudarshan CD, Cochrane AD, Jun ZH, Soto R, Brizard CP. 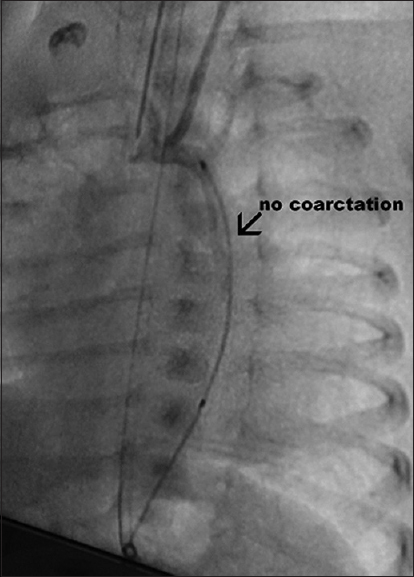 Repair of coarctation of the aorta in infants weighing less than 2 kilograms. Ann Thorac Surg 2006;82:158-63.